You can visit the gardens of Darcie and Tom Homme Jr. in Pendleton in July, and they hope next year neighbors will also open their gardens during a Pendleton-wide garden walk. Photo courtesy Tom Homme Jr.
Darcie and Tom Homme, Jr. are having an “open house” in their garden as they have done for several years, opening up their gardens to anyone who wants to stop by, but they are hoping that next year it will be part of a larger event– a garden walk for the Town of Pendleton. 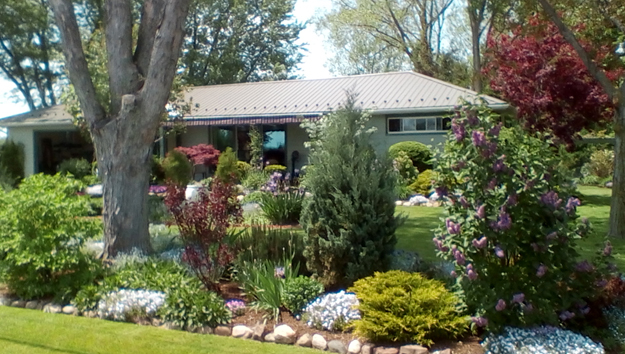 This year you can visit their gardens from noon to 4 p.m. Saturday and Sunday, July 16 and 17 at their home, 6670 Bear Ridge Rd., Pendleton. Their property is on a main thoroughfare that links Lockport with Amherst. When they open their gardens to the public, people tell the couple that they enjoy seeing the gardens as they drive by every day and are glad to get a closer look. The couple lived previously in nearby Lockport and shared their gardens there on Lockport in Bloom. Tom was also on the organizing committee. That seemed like a good idea to Tom because he sees so many attractive gardens in the area. He has a couple of people who are willing to help him organize it, and now he is turning his attention to signing up Pendleton gardeners who are willing to be on the walk. A specific date hasn’t been chosen yet, but it will be in the summer of 2017. “Your garden can be big or small; it’s not a competition,” he said. People with newer gardens are sometimes reluctant to sign up, he noted, but visitors want to see those gardens as well. People who are just starting out can be overwhelmed by landscapes that have been decades in the making. “They want to see how to start and know that’s it’s doable,” he said. If you are interested in sharing your garden on the Pendleton Garden Walk in 2017 or just want more information, call Tom Homme at 210-3091.